China has over 5,500 railway stations for passengers use along its 131,000 kilometers (81,400 miles) long rail lines. The early-built China train stations are usually located in the center of the city or town, operating non-bullet trains and some also operating a few bullet ones. The newly-built railway stations are generally located far from the city center and specialized in high speed trains, such as Beijing South, Shanghai Hongqiao, and Xi'an North; but they mostly can be reached by subway. A train station in China usually consists of one or two squares and a terminal building, inside which ticket offices, waiting rooms, boarding gates, platforms and some affiliated facilities like toilets, hot drinking water, restaurants, and bilingual direction boards are provided. As most railway stations are among the local grandest buildings, they are quite easy to find, even for new comers. In cities and towns, when you see a building with large red or golden Chinese characters (the station’s name) on the top and a square out the front with a continuous stream of people, you have probably found it. Usually, being a transportation hub of a city or town, a train station can be reached by bus, subway, taxi, and even coach. One thing to note is that many cities and towns have more than one train station, such as Beijing, Shanghai, Xi'an, Guangzhou and Shenzhen. Double check the ticket and make sure you are going to the right one before setting out. A square often lies in front or at the rear part of a station, where bus stops, taxi stands, and subway and coach are distributed in and around it. Parking lots can be found on and under ground. What’s more, there are shops, restaurants, vendors, hotels and public toilets. A square also serves as an outdoor waiting room, as it is always filled with travelers before being admitted into the building. • Information Board: A huge LED screen usually hangs outside, showing the timetable and status of trains. You will find the departure time and when and whether or not you can enter the building. • Entrance & Exit: the entrance is usually central to the building. There will be conductors checking the tickets. A moving conveyor belt and a metal detection door are installed at the entrance for security check. The exit usually leads to the city's public transportation. Self-service check-in machines are installed at entrance and exit for ticket checking. • Ticket Office: the ticket offices or booking halls can be found near the entrance. There are boards showing ticket information. Conductors seat inside windows to sell tickets. Many have self-service ticket machines, but after the real-name ticket policy has been applied, travelers can only book tickets on the machine with their second generation Chinese ID cards. E-ticket Pickup Machine is also available, which enable passengers collect their tickets that were booked online. There are also separate ticket windows for platform tickets, and these ticket windows are usually close to the entrance or exit. • Left Luggage: The left luggage center or luggage storage hall is also near the entrance. Some provide 24-hour service. The charge is CNY 5 – 20 per day for luggage of different weights or sizes. Take Xi'an as an example, it charges CNY 5 per day for a bag not exceeding 10 kg and CNY 10 per day for a bag over 10 kg. • Baggage check-in counters: the counters are near the entrance. If your luggage exceeds the weight or size limits, you can have your luggage consigned at the counters. • Others: Police office, passenger service center, restaurants, and shops can also be found outside of the building. • LED Screens: Once inside the building you will see LED screens showing timetable and the designated waiting rooms. Look at these screens carefully to find your waiting room. • Waiting Room: Large stations have more than one waiting room and some also have special soft sleeper, CRH waiting rooms, and mother-and-child rooms. LED boards hanging in each waiting room tell the status of a train: waiting, check-in or delay, and also the platform from which to board. A waiting room usually has several ticket wickets, where a conductor checks and punches your ticket. If there are self-service check-in machines, passengers holding blue tickets only need to insert the tickets into the machine and collect them after passing the gate. The pink ticket cannot be read by the machine. The self-service check-in machines in Beijing South, Shanghai Hongqiao and Tianjin South can also read ticket information through second generation Chinese ID card. Travelers sweep their ID cards over the machine – no paper tickets are required. • Luggage Lockers: timed luggage lockers can be found inside the building. There are usually charged by hours and the sizes of luggage. In Beijing West, the charge for a normal-sized locker is CNY 10 for 7 hours, CNY 15 for 12 hours, CNY 25 for 24 hours, and additional CNY 10 every 12 hours after the first 24 hours; the charge for a large-sized locker is CNY 15 for 7 hours, CNY 25 for 12 hours, CNY 40 for 24 hours, and additional CNY 15 for every 12 hours after the first 24 hours. • Others: there are also convenient facilities such as toilets, boiled drinking water, escalators to the upper floors, inquiry counter, ATMs, lost and found center, public phones, and red cap luggage porters. Restaurants, café, shops, and book stores are also available. Passages and stairs connect the waiting rooms with platforms. Some have escalators but not all do. Platforms are numbered, so it is easy for you to find the right one. On platforms, there are stalls selling all kinds of snacks, beverages, magazines and newspapers. Clear signs are available showing the way out upon arrival, although most are in Chinese. Everything was fine. Responding time to questions was fast. Travel information wa excellent. Tickets were delivered to my Changchun hotel without any inconvenience. Orientation on the train station was uncomplicated. Gate and trainnumber are readable for non Chinese people. If you need help you need to speak Chinese. At least in Changchun. Thanks , it was very good and professional. I was quite nervous about booking my reservations myself, but it was so easy with your website. We picked up all the tickets at the 1st train station so after that we just needed to arrive and go through security. The trains were definately the best way to travel in China. It may have taken a little longer to travel by train versus air but we got to see the landscape along the journey and there was so much more comfort and room in the train. The service was absolutely perfect. Everything worked just fine. I will recommend you to friends. ​All went well. Thank you for your very efficient service. Using TravelChinaGuide has been a really great experience for me. Everything is very clear and booking is super easy! I like that you have the option of booking multiple trips at once, definitely saves time. If there was any kind of problem (e.g. ticket sold out) I was notified promptly and didn't have to change the ticket myself, also very convenient! Customer service is really great and a huge selling point for me, and also that the site is easy to use. Thank you for all the arrangements regarding my tickets. It was delivered to my hotel as i requested so the whole process was easy for me. Thanks for your great service. I make it a point to use your services for my trip as it has always been a pleasant experience. I find the tickets waiting at the hotel when I arrive and I have never had a problem at the station. You may want to advise travelers with paper tickets that they need to find the ticket taker at the platform entrance to go around the automated entry gates. Is there any English guidance in the stations, particularly Beijing, Pingyao, Xi'an? Some basic signs in the stations has English marks but more detailed guidance are hard to find. English service is hard to find at ticket counter. Some times local people are willing for help and if lucky enough you may met another group of international travelers. Anyway, in general, the English service can be find at station but far from enough. 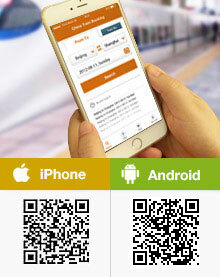 Can I buy at Zhuhai station a ticket from Zhuhai to Beijing? And can I also buy this ticket at Hong Kong West Kowloon Railway Station? You can buy it at west kowloon (counter 1 to 5) with a handling fee HKD30 per ticket. It would be better to buy the tickets in advance since there is only one ride for this trip. Also, this direct ride seems only available on each Friday to next Monday. Hi! I would like to know if there is a luggage storage in the high speed train station in Xi'an. I'll be there next september just for the day. Thanks! I think I saw the locker in 2F and also seems available near the metro exit. You can try to find it. Where is the exact location of dazu south train station? How long does it take to get from there to the Dazu rock carvings? It is next to the Highway, there is no detailed street name mentioned. But you can take buses to reach the Dazu Rock Carvings. You may take bus No. 206 to Dazu Yinxiang first and then change to bus No. 205 and finally get off at Baoding Pachusuo. It is about 800m away from the Rock Carvings. The bus would take at least 2 hours and if you take the wating time etc into consideration, the time would be even longer. could u ple suggest near station from India or Nepal to catch a train to reach lahsa.or any route do u suggest.